Last week, we reported that Facebook and HTC are teaming up to launch a smartphone: HTC is building the hardware while Facebook is building an experience to run on the device. As we previously reported, this new Facebook interface gives quick access to Facebook functionality like messaging, photos, and contacts. It is called Facebook Home. We also previously reported that the first HTC launch device for Facebook Home would be akin to a slightly larger iPhone 5 with capacitive buttons along the bottom. Sources who have seen the Facebook/HTC smartphone hardware in-person say it is reminiscent of an iPhone. It includes an iPhone-like “home button” on the bottom center, and this button is surrounded by horizontal function keys on the right and left side. These buttons are said to be capacitive. Above the keys is a display slightly larger in size to the 4-inch display found on the iPhone 5. Recent rumors have pointed to a collaborative Facebook/HTC phone featuring a 4.3-inch display. 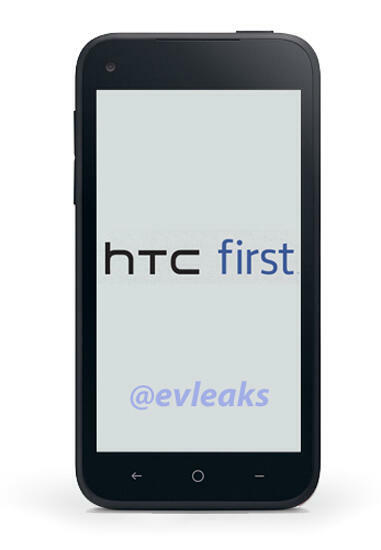 Today, @evleaks has published a photo of an HTC device called the “first.” It looks pretty much identical to the Facebook-HTC device that we described last week. Given that the image lines up with what previously heard, we expect the device shown to above to be the first, or one of the first, Facebook Home handsets. Additionally, our original sources are now saying that this device appears to be the FaceBook Home device that they have seen.